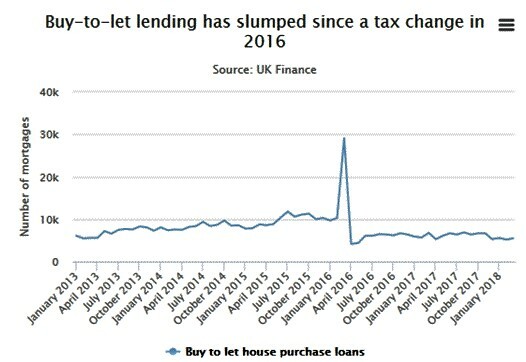 Taxes and regulations are knocking the life out of Britain’s buy-to-let market, with the value of mortgages taken out by landlords in March plunging by 20pc compared with the same month of 2017. A total of 5,500 buy-to-let loans were taken out in the month, banking industry group UK Finance said, down from 6,800 a year ago. So far this year 16,300 properties have been bought with a buy-to-let mortgage, down 11pc on the 18,400 purchased in the opening three months of 2017. “With tax changes, as well as rising interest rates, set to erode landlords’ returns over the next few years, it seems increasingly unlikely that buy-to-let will recover anytime soon,” said Hansen Lu at Capital Economics. Those include an extra 3pc stamp duty charge on second-home owners as well as a reduction in tax deductibility of interest payments, and extra affordability checks on landlords. High prices are also holding back demand in some areas. “Many investors, both from the UK and overseas, are holding back from investing in London at present. Property prices are just too high and this, coupled with the stamp duty surcharge for second home purchases, means London is not a viable buy-to-let opportunity, particularly when it comes to new build,” said James Cameron at property management company Vesper Homes. The number of home-movers fell by a more modest 8pc to 28,400 in March, and was down only 0.5pc in the first quarter as a whole, compared with the first three months of 2017. By contrast the number of first-time buyers in March was down 2pc on the year, while over the first quarter volumes increased by 2pc. After years of surging prices, a recent pause in the market – particularly in London – has helped affordability. First-time buyers borrowed an average of 3.6-times their income in March, a level which has barely changed over the past 11 months, and which is down a touch from 3.64-times in November. Repayments have also slid a touch to 17pc of first-time buyers’ income, from 17.5pc in August 2017 aided by low interest rates which have kept a lid on costs. Remortgaging levels have dipped in recent months after a frenzy in the months before and shortly after the Bank of England’s move to raise its base rate from 0.25pc to 0.5pc in November. UK Finance found 32,400 homeowners remortgaged in March, down from 36,800 a year earlier and a recent peak of 49,900 in January.